Over 1000 years ago, Vikings introduced sheep to the Highlands of Scotland. These sheep were small and hardy with either two or four horns, short tails and able to withstand very harsh weather conditions. They were very independent requiring little care and interference from humans. 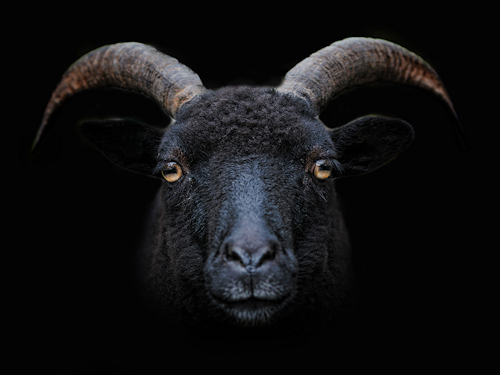 Hebridean sheep are also related to other North European breeds such as the Shetland, North Ronaldsay, Manx Loaghtan and Icelandic. Towards the end of the eighteenth century this small and hardy sheep were thriving. Sadly, the agricultural revolution, the introduction of new breeds and the clearance of many sheep farms from the area took its toll. The sheep were replaced by what were considered "improved" breeds and by the early twentieth century, these sheep, which had been in the region for almost a thousand years, had been almost wiped out. By the end of the nineteenth century, flocks of Hebridean Sheep, which were uniformly black in colour, were reintroduced to the parklands of large country estates both in Scotland and in England. The development of these parkland flocks is greatly responsible for saving the breed as they would otherwise not have survived into the mid-twentieth century. Black horned domestic animals have been favoured by many shepherds, not just for aesthetic reasons but because their feet are harder, grow more slowly and are more resistant to rot. Hebridean sheep are well known for their hardiness in all weathers (although ours hide in their shelter when its raining!) and are resistant to both fly strike and foot rot. The ewes tend to lamb easily, requiring little assistance, produce abundant milk and have excellent mothering instincts. In 1973 the Rare Breeds Survival Trust identified Hebridean sheep as a breed in danger of extinction. Only a few parkland flocks remained and there were no sheep discovered in their homelands of the west of Scotland. Today the Hebridean is a success story having been taken off the Rare Breed Watch List. While The RBST will keep an eye on the development of this wonderful breed, their focus is now on the Boreray Breed, which descend from the same Islands and bear a similar history. also a selection of yarn and wool products. wool, yarn, wool products, fleeces, free range eggs and hatching eggs, Christmas Gifts, Birthday Presents.